HN Issue 13: The Power of a Plan! Sophal, a proud resident of Chuuk, was sponsored at the age of 10 years old until she entered junior high. Through sponsorship, she remembers being provided a bicycle, a school uniform and school supplies. Her mother is thrilled with the difference FH and their community’s development plan made in their lives. It starts with a plan. How the journey from survival to sustainability has dramatically changed the landscape in communities a world apart and inspired others to follow in their footsteps. In 1999 the leaders and families of Chhuk, Cambodia partnered with FH Canada as a last hope. The population was still recovering from a brutal civil war and infrastructure was almost non-existent. Crops couldn’t always provide enough food, and crop failure was common and devastating. Education was rare, health poor, and opportunity unheard of. Survival was the daily goal. In 2006, Chhuk was unrecognizable. Seven years after partnering with FH, the community was ready to graduate as completely self-sufficient. It’s been another seven years since then, and the community continues to excel. FH Canada president Ben Hoogendoorn was recently in Cambodia and was blown away when he visited the former FH partner community. Farms in the area are fully organic, using compost for fertilizer and all natural ingredients for pest control. Years of healthy soil care have changed the quality of the land. “The pride they showed in touring us around was evident,” says an impressed Ben. Farming techniques aren’t the only agricultural reminders of the prior partnership. In 2002, FH introduced animal stocking into the community with six initial cows and training on how to care for and house them effectively. There are currently 182 cows in Chhuk, and almost everyone in the community has received a cow. The introduction of livestock has impacted the agriculture, nutrition, and economy of the community. When community members began to earn an income, FH encouraged groups to save money together with specific projects and purchases in mind. Today the community and church leaders have taken over this initiative, and there are currently close to 400 community members saving together in these groups. In addition to saving, members loan money to each other, which ultimately helps grow their savings pool. More and more, though, the group members are choosing not to keep all the profits from their savings. This isn’t the only way the community members are looking out for each other. They’ve also started “rice banks” as a safety net in case people fall on hard times. Remarkably, the community has also opened a preschool and a “private school” where over 500 students come every day for tutoring so they can qualify for college and university scholarships. Chhuk has again become unrecognizable—this time from where it was when it graduated from its seven-year partnership in 2006. The power of that initial seven-year plan has multiplied exponentially another seven years later. A world away, Busekera, Rwanda maps out their plan to self-sustainability. Families in Busekera are optimistic as they look to the dramatic results from the eight-year FH partnership in Cubi community just 20 kilometres away. It’s eighteen months into Busekera’s relationship with FH, and community leaders are moving forward on their first chosen priority: access to education. There are 4,000 children in Busekera, but only six classrooms that are almost 50 years old. As is common in Rwanda, the children attend school in morning and afternoon shifts so that more kids have access to classes. Still, it’s not enough. As one part of the community’s new education strategy, fully watertight classrooms are being constructed. Local labour has been used in every step of the process—from preparing the site to pouring the foundation to building the wood and brick structures. When trucks were having difficulty accessing the site with construction materials, community members even volunteered to level the road leading to the school. Wall-sized chalkboards and desks -- two popular items in the FH Canada Gifts for Change gift guide this past Christmas -- are being installed to complete the new classrooms. In addition to the classrooms, a large water tank has been installed at the school to catch and store rainwater for drinking and sanitation. While many stages and priorities lie ahead in Busekera’s development plan, families are energized by the possibilities. 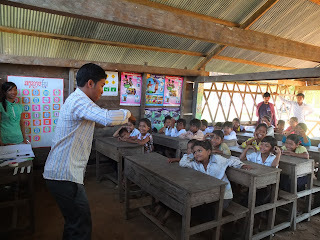 They’re working towards a 2021 graduation date, when they will join the ranks of Cubi, Chhuk, and many others as a completely self-sustainable community. Food for the Hungry: HN Issue 13: The Power of a Plan!